Is your pantry running low? You can order natural and organic groceries online at Thrive Market, and have them delivered door to door— at wholesale. 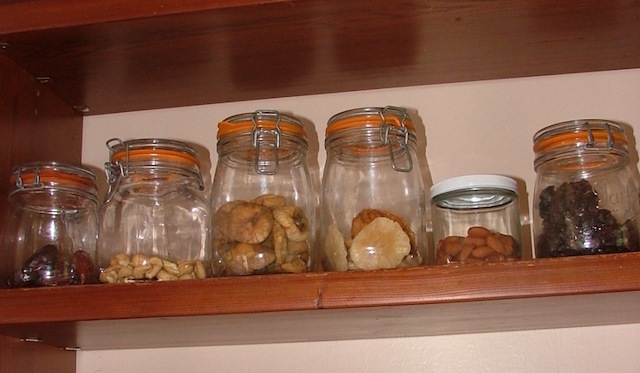 Everything’s non-perishable like the nuts and dried fruits above (yes, they’re all organic!). There’s also tea and coffee, oil and vinegar, and more. Conveniently, Thrive offers household supplies too. Have you checked out Thrive Market? This wholesale online store has become our backup to local shopping. Here you can order high-quality natural and organic groceries and household products. And have them delivered door to door, almost anywhere in the U.S.
To bring you the scoop, I registered to find out more. When we actually order, I’ll report back! Making most of its profit from membership fees, not sales. Subscription model + loyalty = winning formula. Offering only a few major brands in each product category. And the most popular products, at that. Including its expanding private-label brand. I expect the focus to be on their top values: Gluten-Free, Moms, Paleo, Raw, Staples and Vegan. Among foods, focusing on packaged non-perishables. For fresh or frozen, you’ll need to go elsewhere. I love Thrive’s social enterprise spirit! Their mission is “… To make healthy living easy and affordable for everyone”. … When you buy a Thrive Market membership, you’re also donating one to a low-income family, teacher, veteran, or student. We also provide educational content and grocery stipends to our Gives members. That way, we can all Thrive together. You must register (for free) to check out the full product range. Here’s a sampling. Cleaning products, tools and accessories. By the way, you can clean like a pro— with natural and organic products! Pest control products made with natural and botanical ingredients. Beauty, bath and body products. You’ll find all the staples you’d expect. Like tea, coffee, nuts, whole grains, baking goods, oils, vinegars, and more. These costs add up so fast! So I limit myself to the very basics. I pulled out all the natural and organic supplements I take, including herbs and superfoods. On my natural health blog, I’ve listed the ones I found at Thrive. By the way, I escaped chronic pain— without drugs or surgery. What made a lasting difference is natural and organic foods, and anti-inflammatory herbs like turmeric and ginger. Everything you’ll find at Thrive. Thrive is listening to their customers. And it shows. We have carefully screened our products to ensure we do not carry any GMO foods. We also focus on providing USDA Certified Organic options wherever they exist. Genetically Modified Organisms are prohibited under the USDA Organic guidelines. Here you’ll find brands that “exude the values of health, sustainability, and premium quality”. You can search for natural and organic groceries by type or brand. Or screen for one or more of your personal values. Diet type. Gluten Free, Raw, Vegan, and more. Certification. Organic, Non-GMO Project Verified, Fair Trade, and more. Health and Ingredients. Natural, Low glycemic, Petroleum-Free, Fragrance-Free, No Added Sugars or Sweeteners, and more— I counted 66 total! Environmental or Social Cause. Fair Trade, Made in U.S.A., Made With Renewable Energy, and more. Have you shopped at Thrive Market? How’s your experience been, compared to what you have available locally, or other online stores?